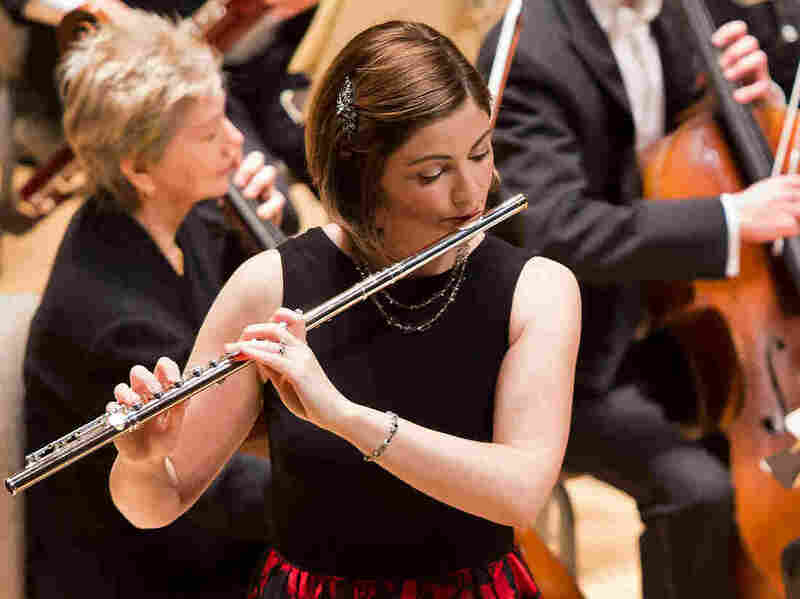 Seeking Pay Equity, Female Flutist Sues Boston Symphony Orchestra The orchestra's top flutist, Elizabeth Rowe, says that she is paid substantially less than her closest counterpart — a man. Her suit may be the first filed under a new Massachusetts pay equity law. Flutist Elizabeth Rowe, performing as a soloist with the Boston Symphony Orchestra in 2016. Rowe's suit was filed in Massachusetts' Suffolk County Superior Court on Monday morning, the day after a new, statewide equal pay law went into effect. Her suit may be the first gender pay equity claim filed under the Massachusetts Equal Pay Law (MEPA). She is asking for more than $200,000 in unpaid wages from the orchestra. Rowe's lawyer, Elizabeth A. Rodgers, says that her client has met repeatedly this year with the BSO administration in hopes of resolving the matter, including providing them with documentation of MEPA. The statute passed in 2016 but did not take effect until this past Sunday, specifically so that companies had ample time to audit and remedy salary and wage gaps. Rowe says that Ferrillo's role in the orchestra is the most comparable to her own, and yet she is paid approximately 75 percent of his earnings. Along with playing next to Rowe for the past 14 years, Ferrillo was part of the hiring committee when Rowe auditioned for the BSO. Within Rowe's lawsuit, he is quoted as calling Rowe "the finest orchestral flutist in North America and absolutely equal to himself." Both Rowe and Ferrillo lead their respective sections, are members of the Boston Symphony Chamber Players (a smaller ensemble of BSO principal musicians who perform and record separately from the larger orchestra), and have very similar leadership responsibilities within the BSO. The principal flutist and oboist are often among the top five highest-paid artists within the most prestigious U.S. orchestras. Along with playing in the BSO, Rowe teaches at the New England Conservatory and at the Tanglewood Music Center, the program for college-aged and emerging professional musicians that takes place at the BSO's summer home in Lenox, Mass. Since "blind" audition processes were introduced at most American orchestras in the 1970s and 1980s — in which musicians play hidden by screens and usually on carpeting to disguise the distinctive clicking sound of women's shoes on the floor — the number of female musicians hired to play in U.S. symphonies has risen exponentially. But more equitable gender (and racial) representation remains very much an issue in the orchestral world, including the number of female soloists, conductors and composers who are being showcased. In the 2018-19 season, the BSO will feature six female composers out of 45 total. That number ties Boston with the Los Angeles Philharmonic for the greatest number of female composers featured by a major American orchestra in the upcoming season. When Rowe was hired in 2004, there was only one other female principal musician at the BSO: Ann Hobson Pilot, a now-retired harpist who joined the symphony in 1969 and became principal harpist in 1980. Within her suit, Rowe alleges that the symphony's management and public relations staff asked her in December 2017 to participate in the creation of a National Geographic documentary episode, hosted by Katie Couric, that would address the issue of blind auditions and how its early introduction at the BSO — in 1952, decades ahead of other ensembles — reshaped the orchestra's demographics. Rowe says that she accepted the request, but mentioned again her concerns about current gender-equality issues within the BSO, "including known salary discrimination." Rowe says that the invitation to participate in the Couric documentary was "immediately rescinded." Rowe's attorney, Elizabeth A. Rodgers, says that her client turned to a lawsuit to address her pay disparity as a last-resort measure. "She loves her job," Rodgers says, "and wanted — and wants — very much to resolve this internally, with an amicable and prompt resolution." A Boston Symphony Orchestra spokesperson tells NPR that it hasn't been served Rowe's lawsuit, so "we have no comment on possible or pending litigation." A previous version of this story incorrectly said Ann Hobson Pilot joined the Boston Symphony Orchestra in 1952. She joined in 1969.